paid ($250). 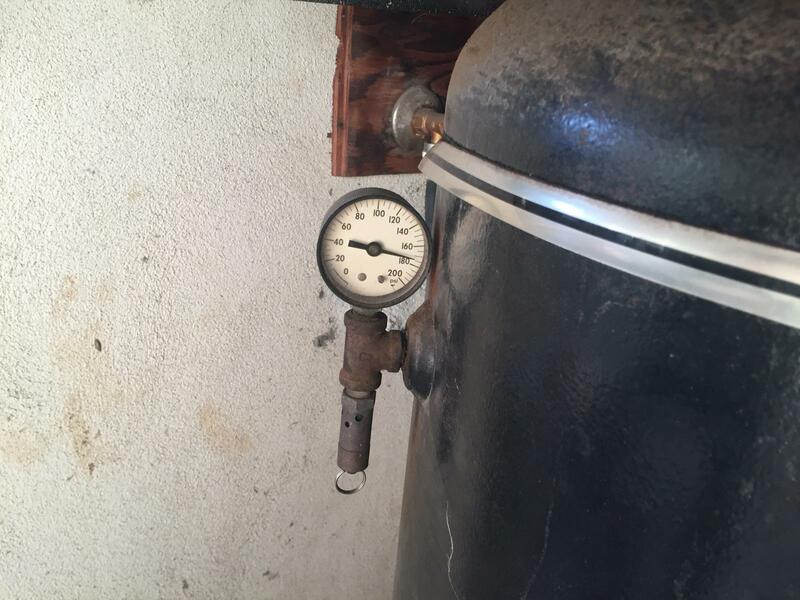 It is an old store bought 60 Gal, Sanborn model 50-17-60V, 2 stage with a T29 pump head, currently running at 1400RPM! the newish electric motor running it is a 3470 rpm HF (3) HP S.F. 1.15 (bogus 3HP, probably a 2HP overrated). 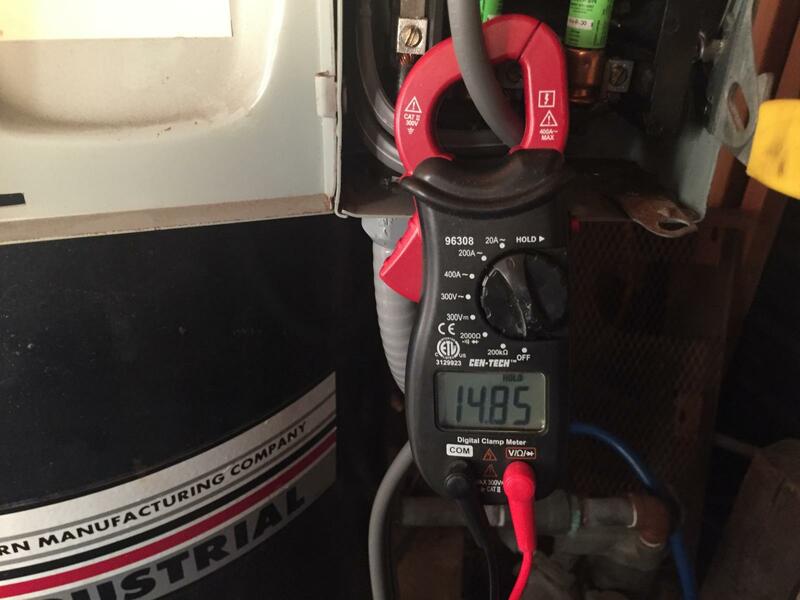 I turned compressor on and the amps were at 18 amps @245 volts @ 50 lbs pressure in the tank. the SFA on the motor says 14.2 amps. Shut it down when it reached 70 lbs or so. I need help slowing/cooling this baby down! Pump flywheel Dia is 14.5 and motor sheave is currently 6 inches. I don't expect the motor to last long in it's current dragster setup. 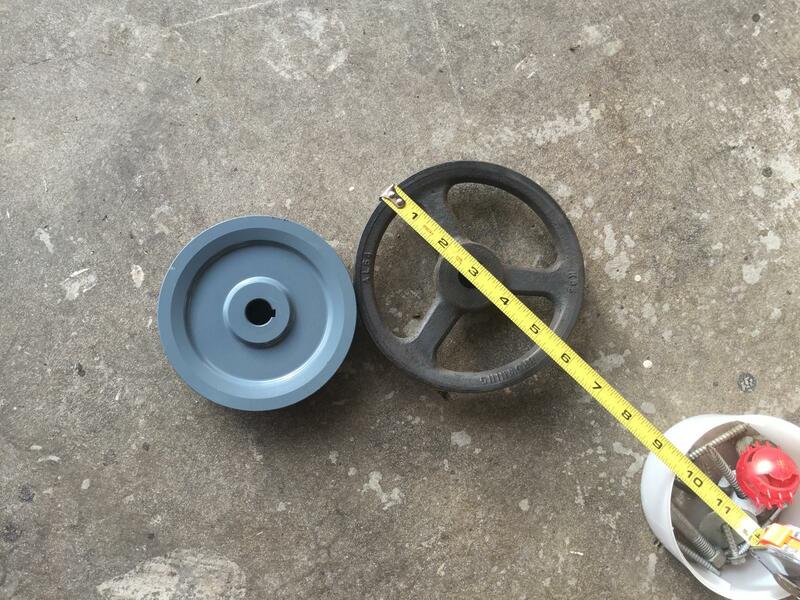 Question is will a 4.75 size pulley be too big? That will slow the pump to 1100 rpm. Since this is a compressor overloading the motor at 50% or less duty cycle I figure I'll get away with it. I can always lower the shutoff pressure if amps become too high right? Any advice? anyone ever do this? So, with a 3 HP motor , the pump must go at 700 RPM to get the max possible pressure. at 700 pump rpm, not all of the available HP would be used. Pump RPM listed for a 3 HP motor is 1000rpm. Plan to get the most CFM available while using this electric motor. If I wanted this pump and motor to last 50 or more years and would be happy with the lower CFM output, a 3 inch pulley would work. If I do the calculations of running this pump at 1000 rpm and the motor at 3470 (listed rpm on motor) pulley drive sheave size comes to 4.18. Because this compressor will be used at a 50% duty cycle or less, I may be OK with a 4.75 sheave. The T29 pump is listed to run anywhere from 700 rpm to 1400 max so I will be within the pump rpm limits. Guess I'm the professor on this one and will have to see full load amps used at highest pressure (175 psi)and motor temperature after a few on-off cycles. 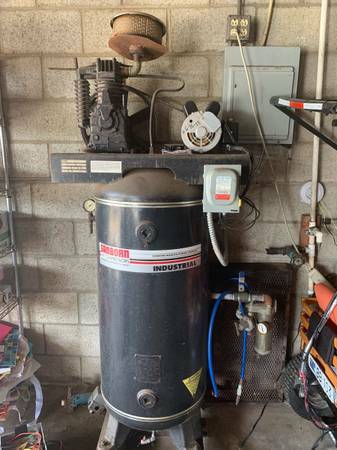 the maximum temperature to safely run the electric motor is listed as long as I don't exceed that I'm sure I will be OK. Haven't run compressor long in it's current configuration but now it does not stall with current 6" pulley but I'm afraid at 18 plus amps current draw at 0 PSI (4HP or so) motor would overheat engaging the thermal overload protection. I get the impression that I will be OK with the 4.75" motor sheave. After the 4.75" sheave install, will do some test runs and measure the amps and winding temperatures. 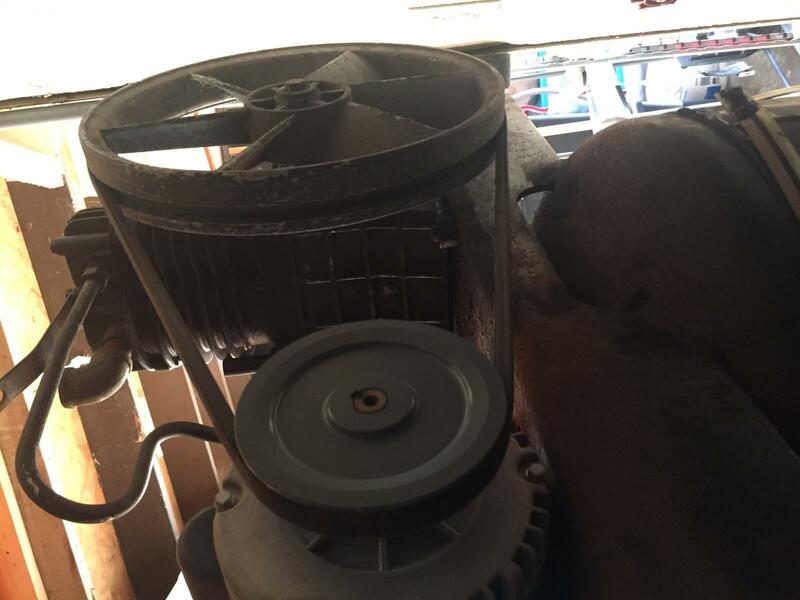 the listed motor insulation is "F" class or 311 degrees maximum running temperature according to NEMA codes. Removed the 6" inch pulley and installed the 4.75. Motor amps is 10A @ 10psi and 15 @ 175psi. The motor was just barely warm after 1 run, maybe 100 degrees. The current draw is within reason now and so far no heat problem has been detected. OK Stephen, it seems that you found the solution. In your case you need to obtain the maximum CFM at the max PSI possible. This implies to work in the motor outer limits, because the pump is well into the specs. The SFA (service factor amps ) is the max current allowable for the motor SF (1.15). In this case SFA = 14.2 A so the full load amp is 14.2A / 1.15 = 12.35A. Nema code recommends to use the SFA in a short term basis. Other way the expected motor life will be reduced for insulation thermal stress, especially in the internal hot spots. You are welcome Stephen, nice to share opinions in this case. I took off the pump and motor to deal with the surface rust on the tank. The T29 pump is amazingly light. Pump is mostly aluminum and the only steel parts seem to be the cylinder bores and crankshaft. Flywheel and everything else is aluminum The counter balance must be on the crankshaft itself. It's amazing this light duty pump has lasted so many years! I see why it is considered a throw away pump though and parts aren't available to repair it. Good enough for a home owner and inexpensive enough too. Has been doing the job for almost 40 years so I'm impressed with it's original design. I see why there is only a one groove pulley needed when other iron compressor pumps (Qwincy, IR, etc.) of 5 HP and up require 2 grooves. Last edited by stevon; 03-13-2019 at 04:13 PM. So I can see that at 175psi motor is running at 15amps @245 volts (measured under load). Using this nifty amp to HP online tool : https://www.inchcalculator.com/amps-...er-calculator/ and giving the motor a generous 75% efficiency rating HP produced at peak load (175psi) is 3.69 HP pulled from the HF 3HP motor. Don't know how long I can pull this with the motor but for now that is where I'm at.